1) Find a UFO or WIP. 2) Snap a “before” picture & post it anywhere on the internet – our thread on Ravelry, on facebook, twitter, instagram, flickr, photobucket, your own blog, etc! 3) Copy and paste the link to your picture in the comments of this thread, OR email a photo to [email protected] and Rachel will upload your photo for you. 4) Turn it into an FO or unravel it and get your yarn back! 6) Feel the freedom and do a happy dance! Prizes will be drawn once per quarter. You can enter as many times as you like throughout the year! If you’re in, even just for one teeny project, let me know by chiming in now! Please share this info because the more the merrier! I can’t wait to see how productive we become in 2015! As always, please leave your thoughts, ideas and questions in the comment section below. This entry was posted on Saturday, January 24th, 2015 at 12:00 AM by Caissa "Cami" McClinton	and is filed under Fun Ramblings. You can follow any responses to this entry through the RSS 2.0 feed. You can skip to the end and leave a response. Pinging is currently not allowed. I’m in. I have two shelves of wip. I am in. This is great! I loved the idea of a blog post that’s WIP’s and UFO’s. I was making a granny shrug. I had to tear it back out. I am tired of looking at this black yarn for a nonexisting granny shrug and the yarn calls for another something. I have a WIP on my hook now that’s GOT to get finished. Promise! Thanks for the push. Thanks for hosting. Fingers Crossed! I’m in! This is a great motivator to getting our UFOs and WIPs done! I have several projects that need an extra push to get done lol. Thank you! I’m in. Great idea, Cami! Your previous post really resonated with me, so I was thrilled to see this challenge. I’ve been in a crochet quandary since moving 18 months ago. I think this challenge will help me sort things out, because I definitely have some WIPs (and some are embarrassingly old). I’ll post my first pic soon. Thank you! So excited to keep on finishing more of these this year! Retired for 3 years (praise God) I have been working on numerous projects – some for sale and A LOT for donations. With Christmas conquered, I just this week decided I would attack my UFOs. Some of them are decades old – you know, like the baby blanket for the now 30 year old nephew? Are those projects UFOs or my bucket list? Ha – either way, I’m definitely in.! Okay…I have a project that qualified (and pictures, too!) Started an afghan last year, but kind of abandoned it for about 10 months. I didn’t finish it until January 2015. Unfortunately…BEFORE you announced this. Can it still be entered? I’m definitely in, I had actually started doing exactly this about 3 weeks ago, already completed one UFO now it is FO, and a bunch more in various WIP stages — have to take the pictures now. It is so satisfying to finally finish those projects! I am soooo in, and I can’t wait to finally finish a whole boatload of projects (so I can start on another boatload of new ones, of course!). I recently retired, joined a local senior center and attend the crochet and knitting group once a week. I am presently rewinding all my left over yarn to use for charity items and donations to the shared yarn stash. Most of the time I am helping another crocheter through a pattern or WIP. 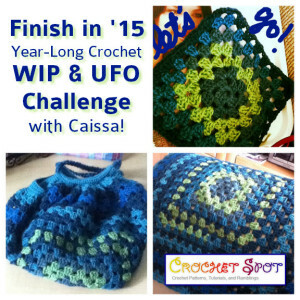 Before retiring from the school system, I finished all my WIP’s and UFO’s over the summer. Count me in!! This was one of my New Year’s resolutions anyway. Will be fun to share photos with others. Maybe I’ll even be inspired to revive my old knit/crochet blog. This is a WIP made of many UFOs. The pieces by the wine rack are more UFOs that need to be added. This is my attempt to finish multiple projects at once. I am definitely in! I have so many WIP’s it’s embarrassing! Serial starter of new projects disease. Definitely a sufferer of that! I would like to participate but finished all my worthwhile UFO’S and WIP’s before the new contest began. Now I am searching through all my yarn containers and totes for a project the needs some love. I am trying to complete a toddlers size sweater, without directions, started 30 years ago for my son and have my fingers crossed. if it happens it will fit my grandson. That 30 year old WIP sweater went to yarn heaven and returned as a rewound ball of yarn and was reborn today as a FO in the form of very warm triangular neck scarf. Hopefully with a little help from my husband I will be able to send the photos from my camera to Rachel. I’m in! I have about 6 projects to finish, this is a good motivator. I’m in! I have at least 4 projects that I have started after Christmas and need to finish. This is a great challenge for me. Thank you for challenging all of us to complete the projects. This is FUN! Good luck to EVERYONE–hey, this contest makes me feel like I’m 15 instead of 55, and that is definitely a GOOD thing! Thanks, Rachel! Maybe now I’ll finally have the incentive to finish that darn Circle Vest! I went through my WIP basket and found this little mouse that I started in January of 2013 (never mind that it was supposed to be a bear!) All I needed to do was sew the legs on. It took me about 10 minutes and now I have an FO instead of a WIP. Oh yeah. I am in. I have 2 patterns I am doing at the moment. A blanket for my hubby and a turkey center piece for thanksgiving. The question I have is, when is this over? I mean can I still enter it or no?